Author contributions: Omary RA, Larson AC and Deng J designed the research; Lewandowski RJ, Deng J, Mulcahy MF, Kulik LM, Sato KT, Ryu RK, Salem R and Omary RA performed the research; Chung JC, Lewandowski RJ, Naik NK, Deng J and Omary RA analyzed the data; Chung JC and Omary RA wrote the paper. AIM: To investigate whether intra-procedural diffusion-weighted magnetic resonance imaging can predict response of hepatocellular carcinoma (HCC) during transcatheter arterial chemoembolization (TACE). METHODS: Sixteen patients (15 male), aged 59 ± 11 years (range: 42-81 years) underwent a total of 21 separate treatments for unresectable HCC in a hybrid magnetic resonance/interventional radiology suite. Anatomical imaging and diffusion-weighted imaging (b = 0, 500 s/mm2) were performed on a 1.5-T unit. Tumor enhancement and apparent diffusion coefficient (ADC, mm2/s) values were assessed immediately before and at 1 and 3 mo after TACE. We calculated the percent change (PC) in ADC values at all time points. We compared follow-up ADC values to baseline values using a paired t test (α = 0.05). RESULTS: The intra-procedural sensitivity, specificity, and positive and negative predictive values (%) for detecting a complete or partial 1-mo tumor response using ADC PC thresholds of ±5%, ±10%, and ±15% were 77, 67, 91, and 40; 54, 67, 88, and 25; and 46, 100, 100, and 30, respectively. There was no clear predictive value for the 3-mo follow-up. Compared to baseline, the immediate post-procedure and 1-mo mean ADC values both increased; the latter obtaining statistical significance (1.48 ± 0.29 mm2/s vs 1.65 ± 0.35 × 10-3 mm2/s, P < 0.014). CONCLUSION: Intra-procedural ADC changes of > 15% predicted 1-mo anatomical HCC response with the greatest accuracy, and can provide valuable feedback at the time of TACE. Hepatocellular carcinoma (HCC) is the third most common cause of death from cancer worldwide and the main cause of death among cirrhotic patients. Transcatheter arterial chemoembolization (TACE) is commonly employed to treat HCC patients who are not candidates for curative surgical resection or transplantation. To date, two separate randomized controlled trials have demonstrated survival benefit in patients undergoing TACE compared to best supportive care[3,4], and TACE is currently recommended as first-line non-curative therapy for non-surgical patients with intermediate-stage HCC[5,6]. Monitoring tumor response is paramount to determine the time interval of repeat treatment or to identify treatment failure. An imaging modality that can serve as an early surrogate marker of tumor necrosis, and objectively predict future tumor response at the time of treatment, would be immensely beneficial, especially because treatment response has been identified as an independent predictor of survival. Conventionally, response is evaluated by magnetic resonance imaging (MRI) at 1-3 mo after TACE. Assessment of anatomical response in the early post-treatment period can be misleading, however, because a reduction in tumor size often does not correlate with the degree of tumor necrosis[7,8]. Furthermore, conventional gadolinium-enhanced MRI might not discern therapy-induced inflammation and granulation tissue from viable tumor[8,9]. Given these limitations, alternative MRI techniques are desired to reflect tumor response more accurately. Diffusion-weighted imaging (DWI), a functional MRI technique, detects MR signal changes in tissues due to water proton motion that varies based upon the degree of cell membrane integrity. The intact membranes of viable tumor cells restrict water diffusion, whereas necrotic tumor cells with disrupted cell membranes exhibit increased water diffusion. This mobility of water is quantified by a constant known as the apparent diffusion coefficient (ADC). Previous preclinical[10,11] and clinical[9,12] studies have shown that tumor necrosis is associated with an increase in ADC value, thereby allowing differentiation between viable and necrotic portions of tumor. Additionally, DWI can determine treatment response several weeks earlier than anatomical imaging[9,12]. However, it remains unclear if these changes in water mobility occur immediately during TACE. If so, it is possible that such changes could provide interventional radiologists with a functional parameter to determine the endpoint of TACE and to predict future response to therapy. Therefore, we tested the hypotheses that ADC changes are present at the time of TACE, and that they can predict conventional 1.5-T MR anatomical image changes at 1 and 3 mo post-TACE. Our local Institutional Review Board approved this Health Insurance Portability and Accountability Act compliant study, which was performed at a single urban, academic tertiary care center. All patients provided informed consent. We enrolled 16 consecutive patients with a total of 21 separate treatment sessions for 21 primary HCC lesions from March 2006 to September 2009. Candidates for TACE were evaluated and treated for unresectable HCC after discussion at a multidisciplinary tumor board conference. Inclusion and exclusion criteria were modified from the report of Brown et al. We included patients who met the following criteria: (1) age > 18 years; (2) ability to provide informed consent; (3) Eastern Cooperative Oncology Group (ECOG) performance status no greater than 2; (4) Child-Pugh class A or B disease; (5) focal or multifocal hepatic malignancy; (6) no contraindications to MRI; and (7) TACE performed in an MR/interventional radiology (IR) suite. Patients were excluded if they met any of the following criteria: (1) life expectancy < 6 mo; (2) Eastern Cooperative Oncology Group performance status ≥ 3; (3) Child-Pugh class C disease; (4) uncorrectable abnormal laboratory values (international normalized ratio > 1.5; platelet count < 5.0 × 104/μL; total serum bilirubin > 4.0 mg/dL; serum creatinine > 2.0 mg/dL); or (5) contraindications to MRI. Certificate of Added Qualification (CAQ)-certified interventional radiologists who specialize in interventional oncology performed all TACE procedures in a sterile MR/IR suite (Miyabi; Siemens, Erlangen, Germany). 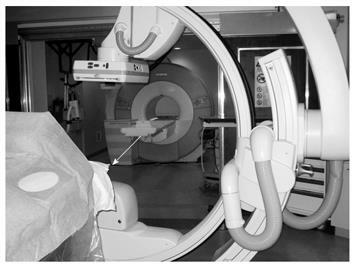 This suite contains a 1.5-T Espree MR imager connected to an Artis dTA digital subtraction angiography (DSA) unit via a sliding patient table (Figure 1). Figure 1 Hybrid MR/IR suite at investigators’ institution. Moving table (arrow) allows the rapid transfer of patients between radiographic DSA and MRI during TACE. MRI: Magnetic resonance imaging; IR: Interventional radiology; DSA: Digital subtraction angiography; TACE: Transcatheter arterial chemoembolization. Patients first underwent DSA for superselective hepatic arterial catheter placement. Next, patients were transferred to the adjacent MR unit for pre-TACE tumor imaging. After baseline tumor imaging, patients were transferred back to the DSA unit and underwent TACE. Subsequently, patients were transferred back to the MR suite to obtain a set of post-TACE images. Lastly, patients underwent a final transfer to the IR suite to remove the vascular sheath and to compress the arterial puncture site manually to achieve hemostasis. Patients were admitted to the hospital for monitoring and discharged 1-2 d later after verification of adequate pain control, ambulation, and oral intake. DSA was performed with a 5.5-F visceral catheter and a 2.8-F microcatheter (Renegade Hi-Flo, Boston Scientific, Natick, MA, USA) that were coaxially inserted over a 0.016-inch diameter guide wire (Headliner, Terumo, Tokyo, Japan) to superselect the hepatic lobar or segmental hepatic artery that supplied the tumor. DSA was performed with iohexol injections (Omnipaque 350; Amersham Health, Princeton, NJ, USA). We performed TACE using a 1:1 solution of emulsifying oily contrast agent and chemotherapeutic agents: 10 mL Ethiodol (Savage Laboratories, Melville, NY, USA) combined with a 10-mL mixture of 100 mg cisplatin, 30 mg doxorubicin, and 30 mg mitomycin C. Using fluoroscopic monitoring, we infused the solution until initial slowing of antegrade blood flow was noted. TACE was then completed by injecting 500-700-μm diameter Embospheres (Biosphere Medical, Rockland, MA, USA) mixed with iohexol. Angiographic endpoint was selected at the discretion of the treating interventional radiologist and ranged from subjective angiographic chemoembolization endpoint (SACE) levels II-IV. All patients underwent anatomical and functional MRI prior to and immediately following TACE therapy. A subset of these patients also received imaging at the 1- and 3-mo follow-up time periods. 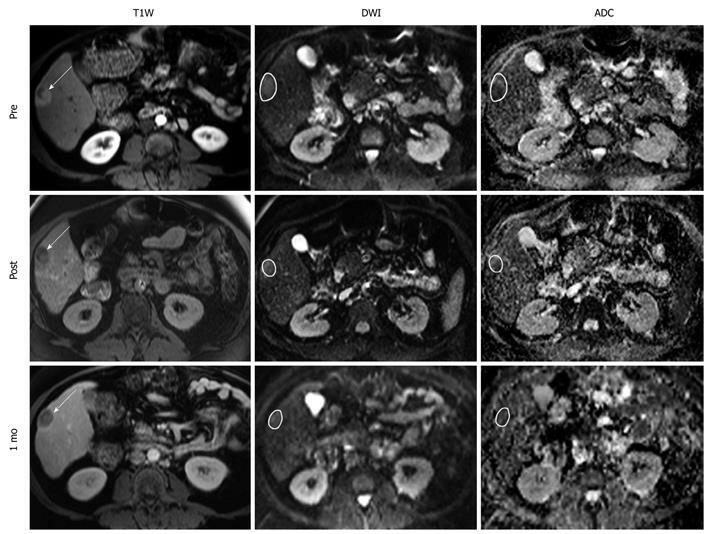 All MRI was performed using a flexible six-channel phased-array abdominal imaging coil on a 1.5-T MRI scanner (Espree; Siemens Medical Solutions, Erlangen, Germany). Anatomical MRI included T2-weighted (T2W) half-Fourier acquisition single-shot turbo spin-echo and T1-weighted (T1W) gradient-recalled-echo imaging sequences, with and without contrast, with fat suppression in the arterial and delayed venous phases. Functional DWI was performed using single-shot spin-echo echo-planar imaging during one or more breath holds (repetition time/echo time = 2500/82 ms; slice thickness/gap = 8/4 mm; bandwidth 1.5 kHz/pixel; partial Fourier factor 6/8; non-selective fat saturation; twice refocused spin-echo diffusion weighting to reduce eddy-current induced distortion with b values of 0 and 500 s/mm2). ADC parametric maps were reconstructed from each set of DW images acquired at each slice position. A Siemens Argus image workstation was used to process all MR images. CAQ-certified interventional radiologists assessed anatomical tumor response on T1W contrast-material-enhanced MRI. Areas of persistent tumor enhancement after treatment were used as an indication of residual tumor, as proposed by the European Association for the Study of the Liver (EASL). Radiographic tumor enhancement was assessed at baseline and at 1 and 3 mo after therapy. Relative change in tumor enhancement was divided into four categories: (1) complete disappearance of tumor enhancement after treatment denoted a complete response (CR); (2) ≥ 50% decrease in area of tumor enhancement corresponded to a partial response (PR); (3) progressive disease (PD) was indicated by a ≥ 25% increase in area of tumor enhancement; and (4) tumor enhancement changes that did not fit any of the previous three categories were designated as stable disease (SD). These percentages were chosen to correspond to the World Health Organization guidelines regarding bi-dimensional tumor size measurements. An objective EASL response included CR and PR alone. DWI and ADC maps were used to determine functional tumor response. A region of interest (ROI) was drawn around each entire tumor on DWI using the T1W images as a reference. For accuracy, the ROI measurements for mean ADC values were then obtained by transferring the DWI ROI to the ADC maps at the corresponding slice positions. ADC values were measured for each tumor at baseline, immediately after treatment, and at 1 and 3 mo. Functional tumor response was reported in ADC units of mm2/s. To determine if the ADC values changed immediately after TACE and whether they predicted anatomical tumor response at long-term follow-up, we calculated the percent change (PC) in ADC values at all time points according to the formula PC = [(ADCpost-ADCpre)/ADCpre] × 100, where ADCpre was the baseline measurement and ADCpost was the measurement obtained at each follow-up time period. Using the anatomical response at 1 and 3 mo as the gold standard, we determined the sensitivity, specificity, positive predictive value (PPV), and negative predictive value (NPV) of the PC in ADC immediately after TACE. These values were calculated using ADC PC absolute thresholds; an increase or decrease in ADC value of more than 5%, 10%, or 15% was considered to be a positive outcome. Figures were prepared using Adobe Photoshop software (Adobe Systems Inc., San Jose, CA, USA). We collected and reviewed all patient demographic data, including α-fetoprotein (AFP), total bilirubin, aspartate aminotransferase (AST) and alanine aminotransferase (ALT), and alkaline phosphatase levels, as well as tumor characteristics, including HCC staging and radiographic evaluations before and after TACE. The mean ± SD was calculated for patient age, time elapsed from treatment to follow-up, liver function laboratory values, and MR measurements of ADC values. A paired t test with α = 0.05 was used to compare differences between ADCpre and ADCpost in all patients. In cases in which a single patient underwent multiple treatments to target separate tumors, ADC values and EASL responses were tabulated according to each individual treatment session and used as separate data points. All statistical tests were performed using Minitab 14 software (Minitab, State College, PA, USA). Sixteen patients (15 male) successfully completed both baseline pre-chemoembolization and immediate post-chemoembolization anatomical MRI and DWI for a total of 21 treatment sessions. From the initial 21 treatments, 15 (71%) and eight (38%) of these cases included the 1-mo (37 ± 11 d) and 3-mo (94 ± 16 d) follow-up imaging, respectively. Mean age was 59 ± 11 years. Table 1 lists the demographic data for this 16-patient cohort. The majority of patients had multi-nodular, non-invasive HCC with moderately preserved underlying liver function (i.e. Child-Pugh class B disease). At the time of treatment, no patients exhibited advanced disease (Okuda stage III) or a cancer of the liver italian program (CLIP) score greater than 2 (Table 2). Liver function tests are summarized in Table 3. Table 1 Patient demographic data (n = 16). 1Two patients had both hepatitis C and alcoholic hepatitis; one patient had both hepatitis B and alcoholic hepatitis. ECOG: Eastern Cooperative Oncology Group. Table 2 HCC staging (n = 16). HCC: Hepatocellular carcinoma; CLIP: Cancer of the liver italian program. Table 3 Liver function tests (mean ± SD). AFP: α-fetoprotein; AST: Aspartate aminotransferase; ALT: Alanine aminotransferase. On the anatomical contrast-material-enhanced T1W MR images, the 1-mo follow-up demonstrated CR, PR, SD, and PD rates of 6%, 75%, 13%, and 6%, respectively, whereas the 3-mo follow-up showed rates of 38%, 0%, 25%, and 38%. Thus, a favorable EASL response (CR or PR) was achieved in 81% of patients at 1 mo and 38% of patients at 3 mo. Mean baseline tumor ADC (× 10-3 mm2/s) was 1.48 ± 0.30, which increased to 1.51 ± 0.36 immediately after TACE, 1.65 ± 0.35 at 1 mo, and then declined to 1.56 ± 0.48 at 3 mo. Compared to baseline, the increase in mean ADC value at 1 mo was statistically significant (P < 0.014); however, the immediate post-procedure ADC change was not significant. Overall mean ADC PC was 3.00% ± 16.4% immediately after TACE, 13.4% ± 14.8% at 1 mo, and 4.25% ± 17.9% at 3 mo. Figure 2 is a scatter-plot graph of 16 different treatment sessions showing individual ADC PC during TACE and corresponding 1-mo EASL status. Shaded regions of the graph represent the ADC PC absolute threshold values of 5%, 10%, and 15%. The sensitivity, specificity, PPV, and NPV of the immediate post-TACE ADC PC in predicting an objective EASL response (CR or PR) at 1 mo are listed in Table 4. There was no discernable predictive value related to the 3-mo anatomical tumor response. Figure 3 is composed of representative MR images from a single patient showing HCC diffusion changes during TACE and corresponding tumor anatomy 1 mo later. 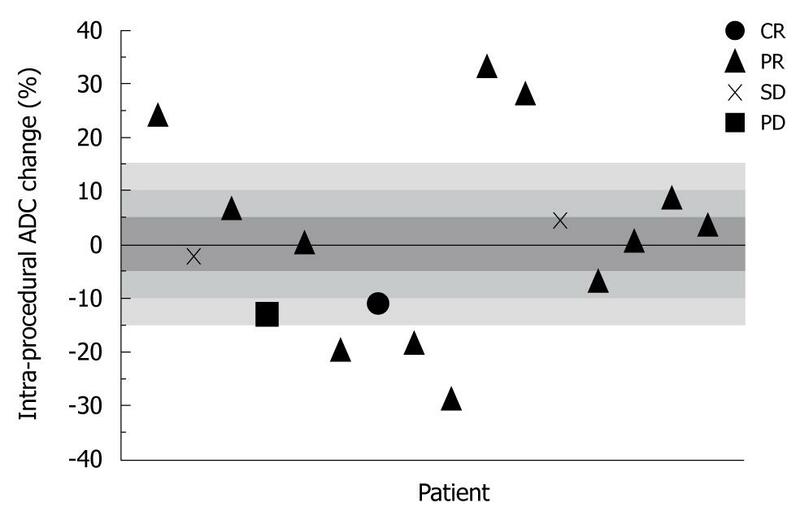 Figure 2 Scatter-plot graph of 16 separately treated HCC lesions showing intra-procedural ADC percent change and their corresponding 1-mo EASL status. ADC: Apparent diffusion coefficient; HCC: Hepatocellular carcinoma; EASL: European Association for the Study of the Liver; CR: Complete response; PR: Partial response; PD: Progressive disease; SD: Stable disease. Figure 3 Representative T1W, DW, and ADC MR images from a 70 year-old man with right-lobe HCC secondary to autoimmune hepatitis. Images were acquired before, immediately after, and 1 mo after TACE. Arrows on the anatomical images indicate tumor location with sample ROIs drawn on the functional MR images. Intra-procedural ADC changed by 28.6%, which predicted a favorable EASL response at 1 mo. T1W: T1-weighted; DW: Diffusion-weighted. Table 4 Utility of intra-procedural ADC %Δ to predict 1-mo HCC response n (%). ADC: Apparent diffusion coefficient; PPV: Positive predictive value; NPV: Negative predictive value. In this prospective study of 16 patients undergoing 21 separate TACE sessions, we showed that intra-procedural ADC changes in tumor function could help predict future anatomical response with increasing certainty at greater absolute ADC PC cut-off values. Specifically, we showed that patients whose ADC increased or decreased from baseline by > 15% immediately after TACE had a 100% rate in predicting a positive EASL response at 1 mo. Our findings also confirm that ADC increases occur within days to weeks following TACE, but indicate that they do not change significantly at the time of therapy. Several previous clinical studies have shown the ability of DWI to map water distribution within HCC tumors and quantify tumor necrosis after transcatheter liver-directed therapy. In patients with HCC undergoing TACE, Kamel et al[12,16] have confirmed the feasibility of DWI to measure tumor response, which shows an increase in ADC at 4-6 wk after TACE. In their studies, regions of increased ADC corresponded to non-enhancing regions of presumed coagulative necrosis on contrast-material-enhanced MRI. More recently, they have demonstrated ADC changes as early as 1 wk post-TACE with no significant changes occurring at 1 d of follow-up. Chen et al have further demonstrated on a 3.0-T MR scanner an increase in HCC ADC values as early as 2-3 d after therapy. Statistically significant ADC increases have also been observed following yttrium-90 radioembolization, and in a feasibility study by Rhee et al, the 1-mo ADC changes were able to predict the 3-mo anatomical tumor response. Cui et al have also looked at the predictive potential of ADC, albeit in cases of systemic chemotherapy for hepatic metastases. None of the aforementioned studies[9,12,16-19], however, were able to address the question of whether ADC changes at the time of chemoembolization could be used to predict future anatomical response. We were able to address this gap in knowledge through the use of an integrated MR/IR suite. Such a suite allowed us to image patients with DWI immediately before and after TACE. Using this setup, we were able to show that DWI could be used intra-procedurally to predict a future anatomical response 1 mo after TACE. A positive result (ADC PC > 15%) would likely suggest adequate HCC treatment; however, a negative result would not be useful feedback and could not be interpreted as insufficient treatment. One explanation for the immediate post-TACE increase in ADC is the ischemic effects of embolization itself, as ischemia-induced cellular swelling has been shown to increase ADC values. Disruption of cell membrane integrity by the cytotoxic effects of TACE would be expected to require more time to evolve, most likely within the first week after therapy[9,17,20]. Notably, large decreases in immediate ADCpost also predicted tumor response. Limiting perfusion could conceivably lead to a measurable ADC reduction because a significant component of ADC values can be due to micro-capillary circulation, as opposed to water mobility alone. The relative decrease in mean ADC value at the longer 3-mo follow-up could be due to clearance of apoptotic bodies by scavenger cells, followed by fibrosis and tissue regeneration. This study had several important limitations. First, the cohort used in our study was limited in size, and not all patients received follow-up imaging due to morbidity, mortality, repeat TACE before 3 mo, liver transplant, or being lost to follow-up. Second, assessments of functional and anatomical tumor response depended upon the selected b values and the anatomical response criteria chosen. Third, while an inverse relationship was noted between an increase in ADC value and a qualitative decrease in viable tumor enhancement, a correlation of magnitude could not be determined. Finally, the results of this study need to be validated by future studies with larger cohorts to determine if intra-procedural ADC changes reliably predict patient prognosis or affect outcome. We concluded that intra-procedural ADC change of > 15% could serve as a useful prognostic indicator of tumor response to TACE. This preliminary result is encouraging because early knowledge of HCC response after initial therapy is essential to revise prognosis and guide future therapy. Use of DWI and ADC mapping in conjunction with traditional anatomical imaging evaluation could further improve tumor response interpretation and subsequent treatment planning. At present, MR/IR suites permit the acquisition of immediate quantitative functional imaging changes, in both tumor perfusion[23,24] and now diffusion. Which of these two functional parameters is more effective as an intra-procedural biomarker to tailor HCC therapy awaits verification by future studies. Early knowledge of hepatocellular carcinoma (HCC) response to transcatheter arterial chemoembolization (TACE) is crucial for determining treatment success, timing of repeat treatment, and patient prognosis. Currently, magnetic resonance imaging (MRI) is used 1-3 mo after treatment to evaluate anatomical tumor response, based upon changes in tumor size and contrast-agent enhancement. Alternatively, diffusion-weighted imaging (DWI) can be used as a functional imaging technique to depict thermally induced motion of water molecules. The extent of water mobility within biological tissues can be quantified by a parameter called the apparent diffusion coefficient (ADC). Recently, ADC values have been shown to change within days to weeks after therapy, which is earlier than changes seen by conventional HCC anatomical size assessment. However, no studies to date have reported the intra-procedural characteristics of ADC and whether these values can predict future tumor response at the time of chemoembolization. A non-invasive and non-ionizing imaging modality that could not only detect, but also predict, early HCC response to treatment would be ideal. DWI has demonstrated the capability to monitor and quantify functional tumor changes. Consequently, the ADC value obtained immediately post-treatment is of much interest because it has the potential to serve as an imaging biomarker of current and possibly future tumor response. Previous studies have described how ADC values change over time during the follow-up period after TACE. Specifically, ADC values of HCC tend to increase after therapy. This initial increase in tumor water mobility is detected as early as 2 d post-treatment, with significant increases during several weeks thereafter. DWI has demonstrated the ability to identify and distinguish between viable and necrotic portions of tumor, and significant increases in ADC often correspond with tumor cell death. Earlier HCC evaluation, confirmation of successful treatment, or discovery of treatment failure could improve therapeutic decision making and patient prognosis. To elucidate further the role of DWI in characterizing tumor response to therapy, the authors investigated whether ADC changes could be detected immediately during intervention, and whether they could predict future HCC response at the time of treatment. They addressed this question by using a hybrid MR/interventional radiology suite, which permitted intra-procedural imaging immediately before and after chemoembolization. This preliminary results suggest that patients whose intra-procedural ADC values increase or decrease by > 15% are more likely to have a favorable anatomical tumor response 1 mo later. TACE involves the minimally invasive delivery of chemotherapy directly to the site of the tumor, via an arterial catheter selectively placed during X-ray fluoroscopy (i.e. under real-time image guidance). This targeted method of drug administration decreases systemic drug toxicity and improves local drug efficacy. TACE is a palliative (i.e. non-curative) treatment that has been shown to improve survival for patients with intermediate-stage unresectable HCC. This is an excellent paper. It is a very interesting topic, especially for the radiological gastrointestinal community.